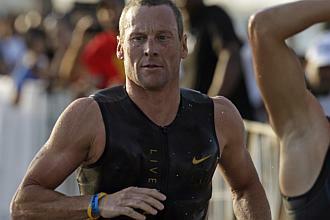 When it comes to Lance Armstrong’s credibility, I flip flop like I’m running for office. Part of me wants to believe that everything he has accomplished as an athlete came from nothing but hard work and dedication to his sport. Then there’s the other part of me that thinks there has to be some truth to all the allegations, witness accounts and stories of doping in the media. After the case against The Texan was dropped last month, I knew it was only a matter of time before we heard it all again. After is 2nd place finish at Ironman Panama 70.3 Mellow Johnny “legitimately” secured himself a spot on the pro start-line for Kona this year. But in classic Lance Armstrong fashion this spot doesn’t come without controversy. He sounded a little annoyed right? Well Big Tex, you’re not retired anymore. You just placed 2nd in your very first race in your return to triathlon which earned you one of the very coveted spots in the biggest race that sport has. So yeah, you’re probably gonna get tested. He later tweeted again and this time didn’t sound like such a child complaining that he had to get up early. At first I thought he was just being a prima donna, then with the 2nd tweet he was trying to save face. Then I read this article about how how The Boss DIDN’T get tested by the WTC in Panama. Wait… WHAT?!?! I’m I being Punked? Yeah, kinda shady. Why wouldn’t he be tested? Here’s my guess. Lance racing in IM events financially benefits two groups, the first is obviously WTC. When lance took 2nd in Panama, it got more media attention then I’ve ever seen Ironman get. How many REAL headlines did you see about Bevan Docherty winning the race? Poor guy got second billing. Plus after Lance’s win 2nd place finish, a press release came out saying that with his qualifying entry to Kona, that NBC and WTC were talking about airing the even live for the first time. Cha Ching. So if WTC was skeptical that Lance may not be clean, they may have intentionally delayed his test. Outside Magazine in January. If you haven’t read it, I highly suggest you do. Between his $200,000 speaking fee and endorsements like Oakley and Michelob Ultra, Lance needs a clean image in order to keep the vault on the ranch full (I don’t really know if there is a vault). So IF Lance wouldn’t have tested clean in Panama on February 12th, then delaying and doing a “random” test on February 29 would give him enough time to clean up. So what’s the answer for Lance when it comes to squashing all the doping rumors? He could make a public spectacle each time he’s tested. He could do like Chrissie Wellington and post his test results online. But what’s more likely is that Lance Armstrong will continue to what he’s done for years, fly almost under the radar until someone else comes out of the shadows to rat on him or until another event like this happens where for an unknown reason his testing was skipped, delayed or lost. As for WTC, they have a brand to protect and need to decide how big of a liability Lance could be to it. When he races Kona with all his hype and later tests positive, it’ll be World Triathlon Corp, not just Lance that will have major image issues to deal with. Next Post When is it time to get new running shoes? Great observations in to the fact that the WTC will be left holding the bag when it’s all said and done. A 1 Million Dollar donation to LiveStrong far outweighs the sponsorship dollars they would have reaped from a successful relationship. But regards to a very well written post ! !